A rather graceful species with drooping brown, few-flowered inflorescences, found in very wet bogs associated with bog-mosses (Sphagnum spp. ), cotton-grass (Eriophorum spp. ), bladderworts (Utricularia spp.) etc. Commoner in the north and west, rarer in the east. 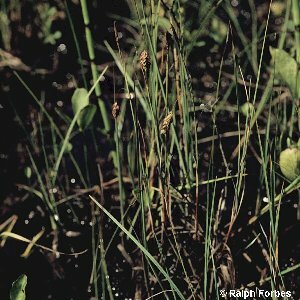 Also known as mud sedge. All names: Carex limosa L.